Halulite Tea Kettle says goodbye to scratches, burn circles and ounces. Supremely lightweight, Halulite is a proprietary alloy that also conducts heat better and more evenly than Titanium so you can leave the extra fuel at home. Unlike competitors cookware, our hard anodized shells are fully formed before hard anodizing, creating a garnet-hard surface that fully encapsulates our even-heating aluminum core. This creates a base shell that boasts that withstands scratches and abrasions like nothing else. It's ultra light without the sacrifices. Now that's smart. Halulite is ultralight weight and superior heating characteristics allow it to cook better, faster and more efficiently than Titanium kettles. 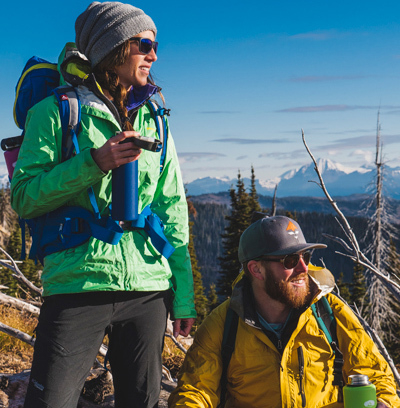 Classic, low-profile design provides the capacity of a 1.8 liter ultralight boiler in the easy-to-pour profile of a tea kettle for boiling water or melting snow on solo adventures. CAUTION: Never heat Halulite cookware to extreme temperatures or allow it to boil dry. Pot and lid intended for camp stove top use only. Not for use with microwave ovens, conventional ovens or open campfires. Handle may become hot when cooking. Always use caution when grasping handle. Never expose handle to direct flame. WARNING: Prior to initial use, always wash with hot water and mild detergent at home and dry immediately. Always allow components to dry completely before storing. DANGER: Always assure that handle is in the fully extended and locked position before use. Always allow unit to cool before cleaning or disassembling. Do not attempt to rapidly cool Halulite Cookware. Always respect fire and all other hot substances.